Go back to The Aviary and leave a comment letting them know you completed the hop. BONUS: For extra chances to win, just like the Paper Wings Productions' Facebook page and/or invite your friends to the hop. Then just come back and let us know ! 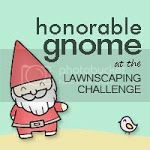 Be sure to leave a separate comment for each of the additional entries. The winner will be announced on Tuesday, March 5th on The Aviary. 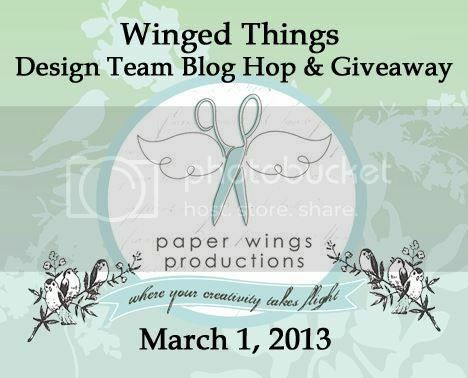 You will also want to go through the blog hop to be inspired by the awesome design team's projects. I have seen peeks and you will love them all! Now on to my little Winged Things project. 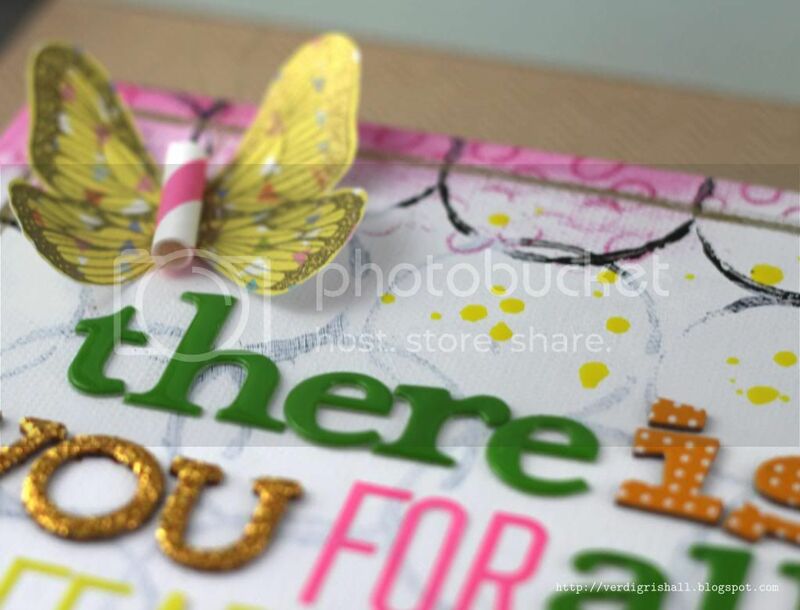 When I thought of the "Winged Things" theme I decided I wanted to make something using the Wings stamp set (or Butterfly Wings) that would be uplifting...which is something I very much need at the moment. So I picked out a 8x10 canvas to make a little piece to hang in my studio. This size is great as it isn't too large or too small. I recently received the Simon Says Stamp March 2013 Card Kit and I loved the happy designs and colors in the kit including the Daphne's Closet 6x6 papers by Lawn Fawn. All of my colors came from those papers. 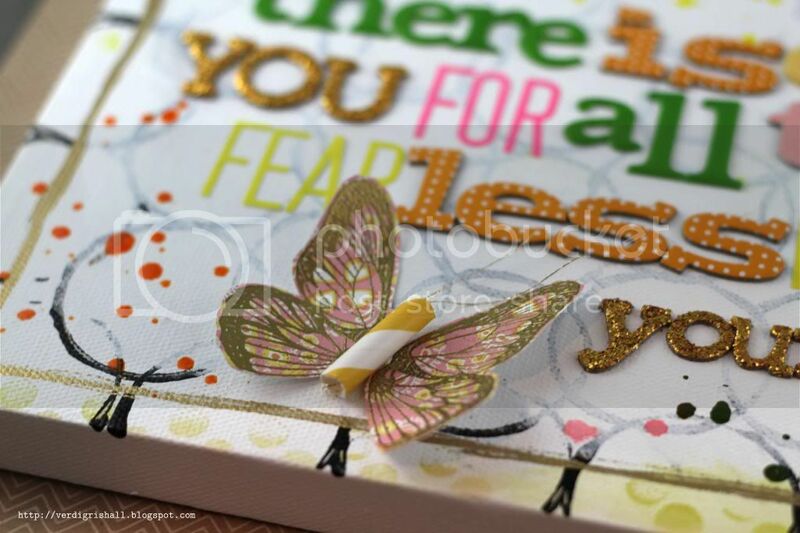 I stamped the set of butterfly wings on a different patterned paper and then gold embossed them. I cut them out...luckily, they are an easy shape to cut. I knew I wanted to make the body of the butterfly from the straws included in the kit and I made attenae with gold thread. I rolled the edges of the wings to mold them and give them some dimension. For the canvas I wanted something that the colors would pop off of. I began by painting the canvas with gesso and then I used a toilet paper roll (who knew they could be so useful in the studio?!) to stamp black paint rings onto the canvas. After the paint dried I added a light wash of gesso to the middle of the canvas just to soften the circles. To the bottom edge I inked up the edge and then stamped the solid small circles from Single Dots Border in green. To the top edge I inked up the edge and then stamped the outline small circles from Single Dots Border in fuschia. For this application I was really happy with the haphazard stamping of clear stamps on canvas. I added a frame with my gold leaf pen to pull in more gold (I can't get enough of it at the moment). Next I went searching online for a quote I liked. 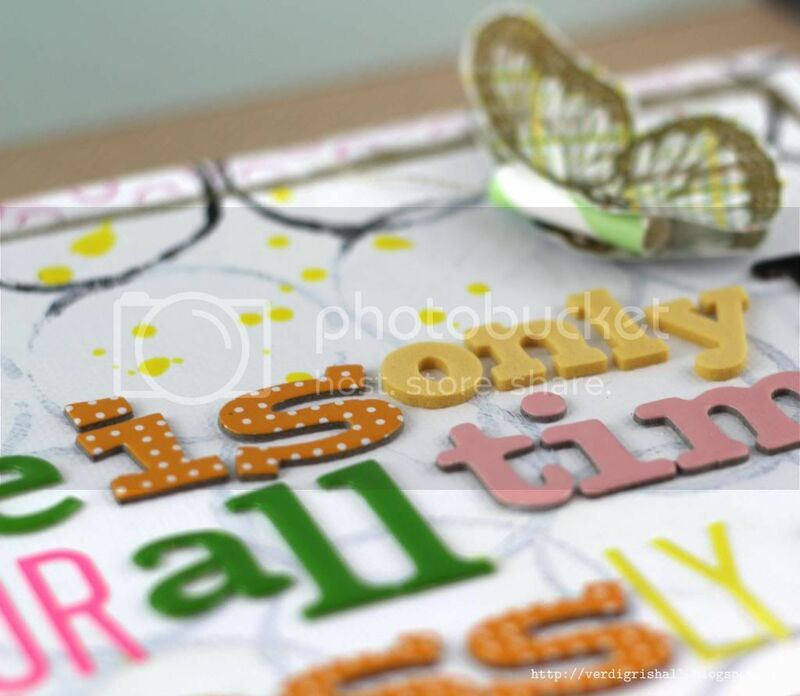 After finding a quote, I shopped my little Thickers collection for the right colors and different textures. Of course the gold glitter Thickers came out...they seem to show up on everything I make right now. I may have to start wearing them. I also pulled out some neon letters from Heidi Swapp because I liked the color and shape. I only altered the 1 by coloring black to make it stand out a bit more. Just a note, the Thickers stick but move pretty easily. I recommend that you adhere them permenantly with something like Glossy Accents, Diamond Glaze or even hot glue if you prefer. 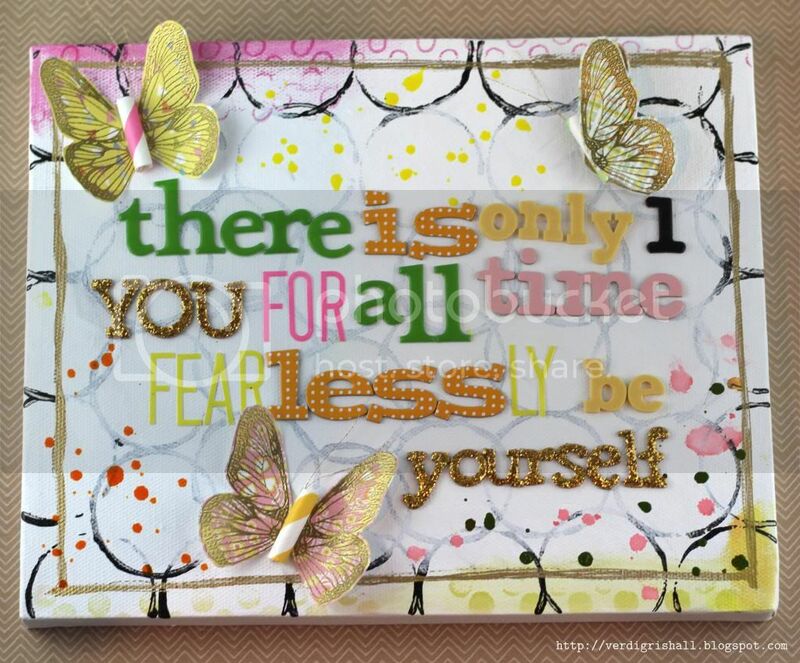 After spelling out my quote I placed my butterflies on the canvas to figure out the placement. I originally made 6 butterflies, but only ended up using 3 for this project. I adhered the butterflies in place with glue dots and/or dimensional adhesive. Lastly I added drops of sprays for added pops of color. Easy peasy. Just change up the colors, design and quote to suit your taste and style. I hope this has inspired you to make something that will uplift you or someone else! And remember to head on over to The Aviary for your chance to win. This is gorgeous!! I love the design and the butterflies!! What a fabulous project!! 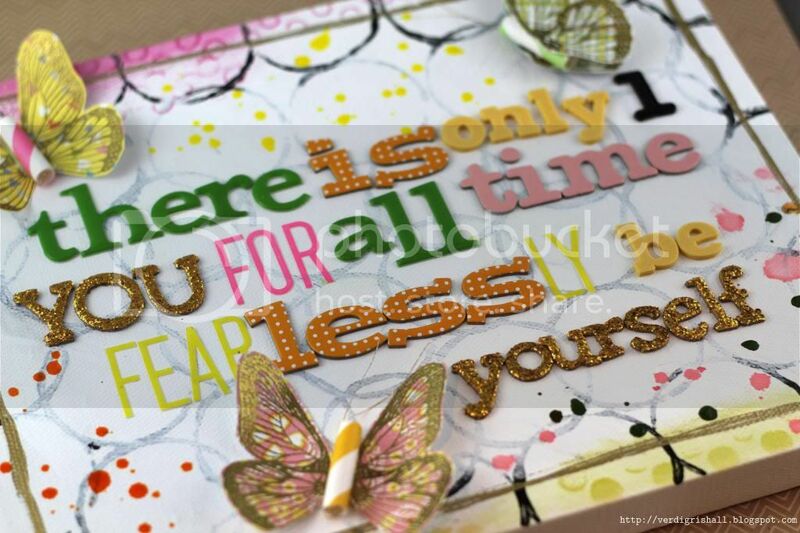 Bright, happy colors-love the mixed fonts! Oh my goodness! Your project is beautiful! Love the colors, the design and the stamps! 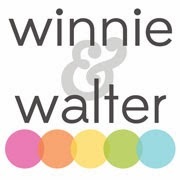 Happy to be in the hop with you today and happy to be a new blog follower! This is awesome! 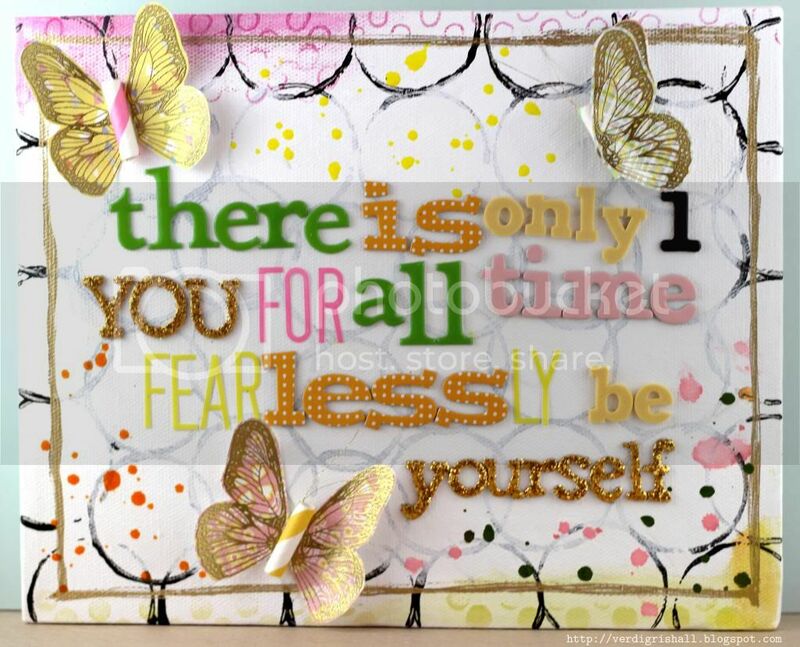 Love all the butterflies and that sentiment is the best! Love your beautiful project, Shay. I can't think of a more fun way to use those stripe straws either. Love it. TFS!! Dear sweet Shay--Love this piece. The straws for butterfly bodies is such a cute idea! Thinking of you. Wow, this is fabulous, love all the Butterfly's and the colors are perfect! I love your canvas, Shay. It is very bright and uplifting, and I hope you are feeling better. You are such an inspiration, thank you for sharing. Lovely project, love the butterflies! Fabulous canvas! I love the idea of the toilet paper rolls!